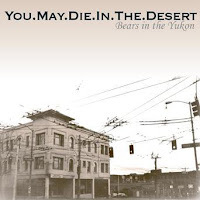 Formed in early 2005, Seattle-based You.May.Die.In.The.Desert started life as Ice To The West, the side-project of Fires To The East members Brandon Salter and Brian Woods. In true post-rock style, they started out using a 4-track tape recorder in the bedroom, with drum machine, bass, guitar and a few effects pedals. They initially gained some recognition through the medium of MySpace, and, following a tour of the USA supporting Strangers Die Every Day, recruited a third band member in the form of drummer Michael Clark. Bears In The Yukon represents the band's second self-released EP. Listening to the EP, it seems hard to believe that You.May.Die.In.The.Desert are only a three-piece, such is the chaotic nature of their music. Focusing on the use of elaborate fretwork and delay effects rather than adopting a typical 'quiet-loud' approach, at times they sound almost like a less depressive, more frenetic This Is Your Captain Speaking. With such intricacy, you might query the ability of You.May.Die.In.The.Desert to perform the tracks live - however, a grainy video posted on Google Video demonstrates their technical adroitness, testifying that the seemingly implausible is actually possible. Like Jaga Jazzist and The Samuel Jackson Five, You.May.Die.In.The.Desert successfully blur the boundaries between post-rock and jazz, although stylistically their sound is far removed from either of their better-known counterparts. None of the songs on the EP could be described as brilliant; at times, there is a tendency for the elaborate guitar lines to sound just a bit too complicated. However, perhaps more importantly, there are no poor tracks - with Bears In The Yukon, You.May.Die.In.The.Desert have recorded a solid, consistent release. Choosing the best track is a difficult task, although for me, the title track (which is also the longest song at just under 8 minutes) has a slight edge. A typically uplifting, vivacious intro gives way to insistent guitar lines and regimented drums highly reminiscent of Explosions In The Sky's 'The Moon Is Down.' The jazziness soon returns, with the song - and with it, the EP - finishing with an animated mix of electro-drum machine and slurring guitar. Most of the songs on the EP are played in a similar fashion, the only notable exception being 'Interlude.' A much more downbeat, atmospheric affair - think Sweek, or perhaps even Sigur Ros - frenzied fingerwork takes a back seat to allow the haunting melody to take centre stage. amazing album. i love your music choices. great work man. Tell your friends and keep coming back!!! can you please re upload it ? I could nt find anywhere else . Hey Neilbuster, I reuploaded it!